Four people entered guesses and all of them had the designer — Blu Bijoux — and the item — bangle bracelets — correct. I know this contest was super easy because the first correct guess came in last Wednesday (I asked her to resend her guess at the correct time). I don’t know why more of you didn’t play because the prize is gorgeous! These 15 bangle bracelets from Max & Chloe are the prize. The sea shell is Amoeba’s and we are keeping it. Believe it or not, it’s a horn and he can play it. He learned in Hawaii. And according to the Random Number Generator, #3 wins! Congratulations South Lakes Mom! 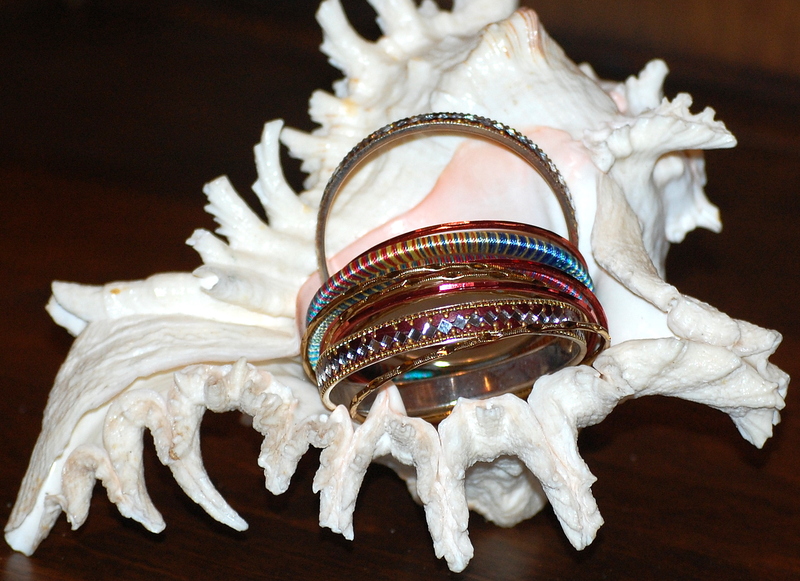 You’ll have a brand new set of spangly, jangly, bangles to ring in the New Year! Amoeba can really play that shell? I’ve heard it very difficult. That is very impressive. The bling looks like fun. Why am I not surprised that Amoeba can play the shell? My son actually started trumpet after we had someone at church show us a shofar and invite each kid to blow it. John’s sounded like a true trumpet blast and from there, it was a natural progression! I knew I was correct! Congrats to Kelley!!!! I wish it were me, but I’m being a good sport here. Those bracelets are very pretty! Enjoy Kelley! You sure have a lot of great giveaways. The bracelets look very pretty. Congrats Khyla.